* Contains all 10 recommended antioxidants. 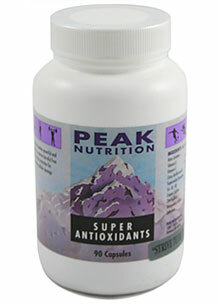 * Aids your body in removing cancerous free radicals from itself. * Provides protection for collagen and connective tissues. * Speeds wound healing and protects against pollutants and toxins. * Helps prevent cataract formation and protects against neurological disorders. Ingredients: Beta Carotene, Vitamin E, Vitamin C, Citrus Bioflavonoids, Superoxide Dismutase, Co Q-10, Copper Sulfate, Zinc Sulfate, Manganese Sulfate, Selenium. Dosage: Take 1-3 tablets a day with meals.